Julia met Anna in 2011 in Karatu, Tanzania at the entry gate of of the hotel site. The petite and shy girl was asking for money to pay the fee for the final exams at school. Being an orphan, Anna could not afford the costs. So she was wooing for donations worth about 20 Euros in order to be able to participate in the final exams of her primary school. Time was ticking away: Exams were taking place the next day. Only who pays for and passes the exams is allowed to continue education and get the basis for good vocational training. With that, chances are improving to find a job later on. Out of this chance encounter the idea was emerging to support Anna long-term and offer her a perspective. In the meantime, Anna is attending a catholic girl’s boarding school. She is provided for the entire school time which includes writing materials and regular meals. 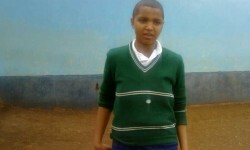 We want to enable Anna to graduate from school. Your donation can help with this. After the first encounter with Anna, Julia was not convince of her story. Julia was afraid that it was a con to get money. So the two made an agreement: Anna should come back to the hotel in the afternoon and bring along the registration documents for the exams. Then Julia would hand her over the money. They made an appointment for 17.00, but no one came to the hotel at the appointed time. Julia and her colleague Olomy which was present at the encounter started to wonder. Even though Julia was skeptical in the morning, her gut feeling was that the girl had told the truth. To make sure that they had not missed Anna, they asked the guard at the entrance. And in fact Anna had been there. However not at the appointed time, but when Julia and her colleague were still in town. The security service had sent Anna away, as she was no hotel guest. Julia was shell-shocked. For one, that Anna had been at the meeting point and had thus told the truth. And also that Julia had missed her and could not help her. What now? Was Anna’s school career to end just because of a missed appointment? But how to find her? Apart from her first name and the fact that she had lost her parents, Julia knew nothing about her. And that in Karatu, a town with a population of 22.000. Julia decided to search for Anna with Olomy accompanying her. The search was hampered by rain and also Julia was due to leave in a couple of hours. They drove through Karatu with no sign of Anna and no one knowing her. Almost no one. At the end of the taxi ride, the cab drive mentioned that even though he did not personally know Anna, he thought he knew who she was. But she was still not found. Julia went back to the hotel downheartedly and had lost all hope to find Anna. That day, Julia was to leave town for Moshi. In the afternoon, good news was coming from Julia’s colleague Olomy: He had in fact found Anna. On her way back from school, she had run into the cab driver. He stopped her and brought her to the hotel to Olomy. From there, Anna and Julia were able to phone. What a joy! It was hard to tell who was more delighted. Julia, as everything was coming to a happy ending, or Anna, as she would be able to pay for her exams. The easiest way to donate is the online donation. Our local project partner: Cletus Olomy. Julia and Olomy have met Anna in Karatu. He and his family care for Anna at times when the boarding school is closed.